Homi Jehangir Bhabha was a renowned Indian nuclear physicist who is also known as ‘The father of the Indian nuclear programme’. He was instrumental in pushing India to the select list of nuclear powered nations. He was also the founding director of the Tata Institute of Fundamental Research (TIFR), as well as the founding director of the Atomic Energy Establishment, Trombay (AEET) which was renamed Bhabha Atomic Research Centre (BARC) in his memory and honour. Homi J. Bhabha was born on 30 October 1909, in a wealthy Parsi family in Mumbai. His father Jehangir Hormusji Bhabha, was a renowned lawyer. He had his schooling at Bombay’s Cathedral and John Connon School. Later he took admission in Elphinstone College. He went to England for higher studies and attended the Royal Institute of Science till 1927. Then he joined Caius College of Cambridge University to obtain a degree in mechanical engineering. Bhabha passed the Mechanical Sciences Tripos exam in 1930 and later he also completed the Mathematics Tripos in 1932. Meanwhile, he worked at the Cavendish Laboratory to complete his doctorate in theoretical physics. During this time, nuclear physics was one of the most significantly emerging fields. Bhabha’s passion was to conduct experiments on particles which also released enormous amounts of radiation and his leading edge research and experiments brought great laurels to Indian physicists. In 1933, Bhabha received his doctorate in nuclear physics. Next year he also completed his doctoral studies in theoretical physics under Ralph H. Fowler. In 1935, he published a paper to determine the cross section of electron-positron scattering; which was later named Bhabha scattering, in his honour. Bhabha’s research also led to the straightforward experimental verification of Albert Einstein’s theory of relativity. Bhabha continued his work at Cambridge until the outbreak of World War II in 1939. In 1939 when Bhabha was in India, World War II started, and he decided to postpone his return to England. He joined the Indian Institute of Science (IIS), headed by renowned physicist C. V. Raman. With help from J. R. D. Tata, he helped in the establishment of the Tata Institute of Fundamental Research (TIFR) in Mumbai. 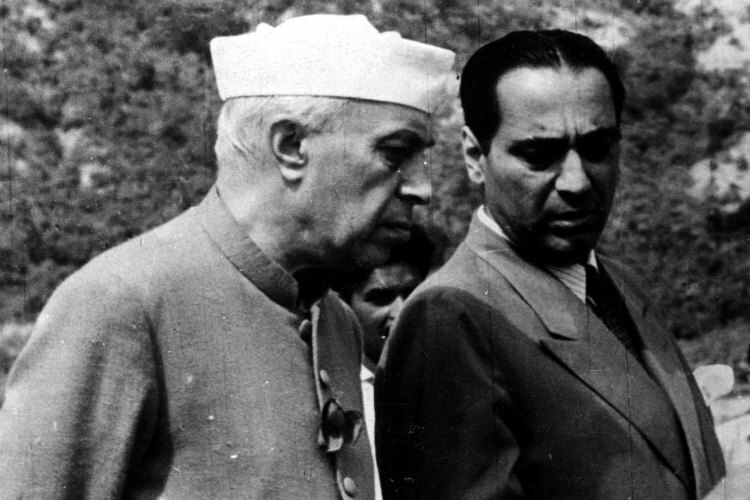 Bhabha also convinced the Congress Party’s senior leaders, including Jawaharlal Nehru, who later became independent India’s first Prime Minister, to start the ambitious nuclear programme. He received a special research grant from the Sir Dorab Tata Trust, with which he established the Cosmic Ray Research Unit at IIS, while conducting research on nuclear weapons in 1944. In 1945, he established the Tata Institute of Fundamental Research (TIFR) in Bombay. In 1948, PM Nehru appointed Bhabha as the director of the nuclear program to develop the nuclear weapons. The Atomic Energy Commission was set up with Bhabha as its first chairman. In 1954, the Atomic Energy Establishment Trombay (AEET) started functioning in 1954; and the Department of Atomic Energy (DAE) was also established. In 1954, he was awarded Padma Bhushan by the Government of India. He also served as the member of the Indian Cabinet’s Scientific Advisory Committee and initiated Indian Space Research. During the 1950s, Bhabha represented India in IAEA conferences. In 1955, he also served as President of the United Nations Conference on the Peaceful Uses of Atomic Energy in Geneva, Switzerland. On 24 January 1966, while on way to Vienna, Austria to attend a meeting of the International Atomic Energy Agency; Bhabha died in a plane crash near Mont Blanc.His untimely death was a big blow to the Indian nuclear programme. Bhabha is generally acknowledged as the father of Indian nuclear power. Bhabha was also a painter, a botanist, and a classical music and opera enthusiast. The Homi Bhabha National Institute which is a deemed university and the Homi Bhabha Centre for Science Education, in Mumbai had been named after him. After his death, the Atomic Energy Establishment at Bombay was renamed as the Bhabha Atomic Research Centre in his memory and to honour his contributions to India’s nuclear capabilities.